Albert Lismayer handmade snow-cat seen on the excellent site : http://www. Self-made two tracks 100 cc scooter 2006, from Russia. Self-made 2WD motorcycle Civar, 18 hp, from Russia. Motochenilles Mercier. Pict J M M at Rétromobile, Paris, 2007 02.
and the book : 'L'Automobile sous l'Uniforme' by François Vauvillier, published by Massin, Paris, 1992. Mercier Motochenilles Type 3, 1939. This prototype belongs to Mario Salvatore, Aix-les-Bains, France. Pict J M M at Rétromobile, Paris, 2007 02. Alpenscooter is a kind of snowmobile of Pozza Company from early 80s used by Mountain Troops of Italian Army. Ski replaces front wheel in snow. OEC (Osborn Engineering Co.,Gasport, Hants, GB). Tracked Motorcycle Prototype, 1928. Pict from 'Wheels & Tracks' N° 74, 2001. Tracked motor cycle in line 3x2, 3 seats, Victoria-Werke AG of Nuremberg, in the 30s. Pict from Wheels & Tracks N° 74, 2001. RASC Triumph based tracked motor cycle, 1927, From GB, is in a museum. Pict of book of Bart H Vanderveen ‘Half-Tracks’, Warne, 1970. Tracked motorcycle of a site of games : http://www.igcd.net/vehicle.php?id=19893&PHPSESSID=c18ff1&width=1366. It is believed steering is by curved track as Hyanide. Tracked conversion of Toyota about the 80s. Pict from 'Livre Mondial des Inventions' d of Valérie-Anne Giscard d'Estaing, Fixot, 1993. BMW tracked motorcycle of 1936 'Sneekrad' or snowmobile. Lehaître tracked motorcycle, 1938. Pict from book 'Le Livre des Inventions' of Valérie-Anne Giscard d'Estaing, Robert Laffond, 1999. Tracked Motorcycle, 1938, of J Lehaitre, Paris. Speed 25 m.p.h. Steering was accomplished by handlebars which controlled a sideways motion of the drive belt. From Modern Mechanix, Feb 1938.
and the review : 'L'Automobiliste' N° 47, Oct-Nov-Dec 1977, article 'Les motochenilles' of C. H. Tavard and Y. M. Bornecque. Moto-chenille Lehaître in 1938 whose 2 little additional wheels were not easy in off-road conditions. Steering was a problem. See the book : 'L'Automobile sous l'Uniforme' by François Vauvillier, published by Massin, Paris, 1992. 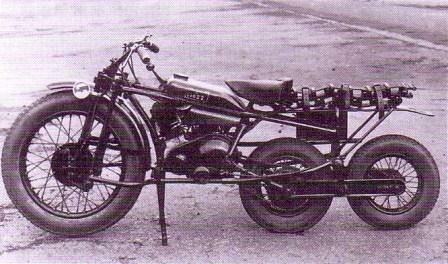 Moto-chenille Courtot in 1935 had 2 tracks and rear wheels were ride control. Off-road capabilities were not better than a classic motorcycle and consumption was 12 times higher. See the book : 'L'Automobile sous l'Uniforme' by François Vauvillier, published by Massin, Paris, 1992. Tracked Roadless Motorcycle based on a Douglas machine. Suspension by cables, about mid-20s. Pict from the book of Stuart Gibbard, Roadless, the Story of Roadless Traction from Tracks to Tractors, Farming Press, 1996. Tracked cycle of Patrick Carn. Pict from book 'Le Livre des Inventions' of Valérie-Anne Giscard d'Estaing, Robert Laffond, 1999. Ktrak tracked cycle, 2007, of course better downslope than upslope. Tracked snow bike, 1982. The trial motor bike Fantic 200 was equipped with a snow kit. Speed 40 km:h.
Two Tracks driven motorcycle project in early 2000 from Hannu and Koivuniemi, Finland. It does not seems that a practical model was built. The J E Love company of Garfield Wa made a track conversion for motorcyles somewere around the 60s. they dont have anything on there website but I know where there is an intact kit.